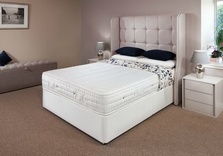 We sell a wide range of modern 6' wide super king size beds handmade for you in our Glasgow bed workshop in all firmness grades including soft, medium, firm, extra firm and hard levels of firmness so whatever your size, weight or budget our carefully chosen range of comfortable super king size divans ensures there is one suitable for you. 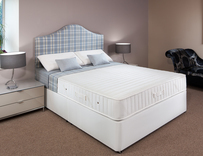 We also specialise in making superking size and extra large divan beds suitable for heavy and larger people. 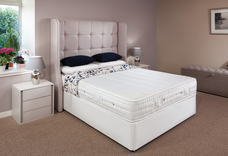 Our super king divan beds come with various storage options - 2 drawers 1 at each side, 4 drawers, a jumbo drawer, 1/2 ottoman or 1/2 ottoman with 2 drawers. As suppliers of respected interior designers and the boutique hotel trade you can be sure of the quality and reliability of our products. 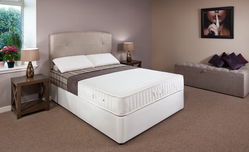 Visit our Glasgow showroom to see our range of superking size divan beds or phone to discuss. 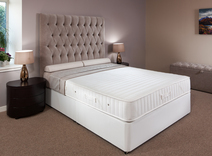 All our super king divan beds can be delivered UK wide and we also supply a wide selection of quality superking upholstered headboards at great prices. 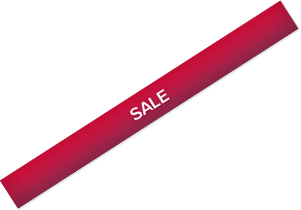 We deliver throughout the UK including to London, Edinburgh, Manchester, Birmingham, Liverpool, Newcastle, Cardiff, Glasgow, Aberdeen, Kent, Surrey, Sussex, Suffolk, Hertfordshire, Bedfordshire, Buckinghamshire, Oxfordshire, Cambridgeshire, Lincolnshire, Wiltshire, Hampshire, Dorset, Devon and the South West, Cheshire, the Midlands, East Anglia and the North West. We can also ship to Europe.